Amechanism of liver injury, such as viral hepatitis or autoimmune hepatitis, is considered to involve the impairment of hepatocytes mediated mainly by lymphocytes. In addition to the direct cytotoxic effects to hepatocytes by lymphocytes, the roles of a variety of cytokines have been reported (1, 2). Activated T cells are directly cytotoxic for hepatocytes or release proinflammatory cytokines, which mediate hepatocyte damage in various models. A well-described mouse model of immune-mediated liver injury is produced by the i.v. injection of the T cell mitogen Con A (3), which results in fulminant hepatitis and is considered to be an experimental murine model of human autoimmune or viral hepatitis (4, 5). In the Con A-induced hepatitis model, activation of T cells and macrophages is important for disease induction, because T cell-specific immunosuppressive drugs, cyclosporine A and FK506, or depletion of liver macrophages (Kupffer cells) by silica particles or clodronate protected mice from liver injury (6, 7, 8). Although the precise mechanisms by which T cells and macrophages induce hepatitis are not fully understood, recent lines of evidence suggest that NK1.1+ CD3+ NKT cells are critically involved in Con A-induced hepatitis (9, 10, 11). Particularly, Kaneko et al. (11) reported that in mice lacking only NKT cells, hepatitis was not induced after i.v. injection of Con A. NKT cells promptly produce IFN-γ and IL-4 after stimulation with Con A, α-galactosylceramide, or anti-CD3 mAb (12, 13). Besides IFN-γ and IL-4, various cytokines are involved in this hepatitis (14, 15, 16, 17, 18, 19). WSX-1 is a novel class I cytokine receptor with homology to the IL-12Rs, and its expression is highly detected in lymphoid tissues such as spleen, thymus, and lymph nodes (20, 21). In an analysis of mice deficient for WSX-1, we demonstrated that WSX-1 is required for normal production of IFN-γ by naive CD4+ T cells (22). We also reported that STAT1 is activated downstream of WSX-1, leading to T-bet induction, followed by IL-12Rβ2 expression in naive CD4+ T cells (23). These results revealed that WSX-1 is critical for initial Th1 commitment. Recently, Pflanz et al. (24) reported that IL-27, a newly identified IL-12-related cytokine composed of EBI-3 and p28, binds to WSX-1. We also reported that IL-27 induce STAT1 phosphorylation downstream of WSX-1 and also that IL-27 causes IL-12 responsiveness to naive CD4+ T cells by induction of IL-12Rβ2 (23). More recently, we have reported that in the absence of WSX-1, both CD4+ T cells and NK1.1+ CD3+ NKT cells overproduced several inflammatory cytokines during Toxoplasma gondii or Trypanosoma cruzi infection (25, 26), demonstrating a new role for WSX-1 as an inhibitory regulator of cell activation and cytokine production. Thus, although the role of IL-27/WSX-1 signaling in the differentiation of naive CD4+ T cells into Th1 population has become clearer, functions of WSX-1 in various milieus have not been fully understood. In this report we examined the role of WSX-1 in NKT cells in the Con A-induced hepatitis model by taking advantage of WSX-1-deficient mice. WSX-1 knockout mice were more sensitive to Con A than wild-type mice by producing significantly higher amounts of serum IFN-γ and IL-4. In addition, overproduction of various proinflammatory cytokines was detected in WSX-1 knockout mice. WSX-1-deficient NKT cells produced more IFN-γ and IL-4 than those from wild-type mice both in vitro and in vivo. Taken together, our results revealed a new function of WSX-1 as a suppressor of hyperinflammatory response of NKT cells, in addition to the previously reported role for Th1 induction. Generation of WSX-1 knockout mice was reported previously (22). Mice were maintained in a specific pathogen-free condition. All the mice used (8–10 wk old) were backcrossed into the C57BL/6 background >10 times. Con A (Sigma-Aldrich, St. Louis, MO) was injected i.v. at an indicated dose in 200 μl of PBS. Two milligrams of anti-INF-γ mAb or anti-IL-4 mAb in 200 μl of PBS were injected i.v. 2 h before Con A injection. For in vivo depletion of NK cells, excluding NKT cells, mice were treated with 200 μg each of anti-asialo-GM1 Ab (Wako Biochemicals, Tokyo, Japan) 60 and 18 h before Con A injection. For depletion of both NK and NKT cells in vivo, mice were injected with a mixture of anti-NK1.1 mAb and anti-Ly49C (50 μg of each; BD PharMingen, San Diego, CA) 24 h before Con A injection (27). For depletion of CD4+ T cells, 250 μg of anti-CD4 mAb (GK1.5) were injected 24 h before Con A injection. For histopathological examination of the liver, livers were taken from mice 18 h after Con A injection, fixed with 4% formaldehyde, and stained with H&E. For aminotransferase determinations, blood was withdrawn at the indicated time after Con A injection. Sera were recovered and stored at −80°C until used. Alanine aminotransferase (ALT)3 activities in sera were determined using a Dry Chem Slide (Fuji Film Medical, Tokyo, Japan) according to the manufacturer’s directions. Similarly collected sera were examined for serum cytokine levels using the LiquiChip Mouse 10-Cytokine Kit (Qiagen, Valencia, CA), a microbead-based ELISA system for simultaneous detection of mouse IL-1β, IL-2, IL-4, IL-5, IL-6, IL-10, IL-12 (p70), GM-CSF, IFN-γ, and TNF-α, and were analyzed with Luminex 100 (Luminex, Austin, TX). Liver mononuclear cells (MNC) were prepared by Percoll gradient as described previously (28). Liver MNC or splenocytes were stained with FITC-anti-CD3ε mAb (BD PharMingen) and PE-anti-NK1.1 mAb (BD PharMingen) and analyzed for expression of the markers with FACSCalibur(BD Biosciences, Mountain View, CA). For flow cytometric analysis of intracellular IFN-γ and IL-4, LMNC were isolated 2 h after Con A injection and were cultured (1 × 106/ml) for 6 h without any stimulation in the presence of GolgiStop plus GolgiPlug (BD PharMingen). Cells were then stained with anti-CD3ε or anti-CD4 vs anti-NK1.1 Ab, fixed, and permeabilized with the Cytofix/Cytoperm Plus kit (BD PharMingen) according to the manufacturer’s directions. Cells were then stained with anti-cytokine Ab and analyzed for expression of the respective cytokines using FACSCalibur. Liver MNC were stimulated (2 × 105/200 μl) for 24 h in vitro with Con A (5 μg/ml) or anti-CD3 Ab (10 μg/ml). Similarly, spleen NK1.1+ cells purified by MACS were stimulated (2 × 105/200 μl) in the presence of irradiated (30 Gy) splenocytes (5 × 105/200 μl) as APC for 24 h. Culture supernatants were examined for IFN-γ or IL-4 production using ELISA Development Kits (Genzyme, Cambridge, MA) according to the manufacturer’s directions. Given the involvement of various cytokines in Con A-induced hepatitis, we investigated the role of WSX-1 in the development of liver injury by comparing WSX-1 knockout mice and wild-type mice. First, WSX-1−/− and WSX-1+/− control mice were injected i.v. with 25 mg/kg body weight of Con A, and serum ALT levels were measured after Con A injection. Serum ALT levels began to increase as early as 6 h after Con A injection, reached a peak at 12 h, and then declined thereafter. As shown in Fig. 1⇓A, there was no difference in the elevation of serum ALT levels in WSX-1+/− and WSX-1−/− mice. However, we noticed that ∼80% of the WSX-1 knockout mice died within 24 h after Con A injection, whereas wild-type mice survived (data not shown). Therefore, we injected mice in both groups with a lower dose (5 mg/kg) of Con A. At this dose, although the elevation of serum ALT was not seen in WSX-1+/− mice, a substantial elevation of serum ALT level was still observed in WSX-1 knockout mice (Fig. 1⇓A, lower panels). Analysis of serum aspartate aminotransferase levels also showed that WSX-1 knockout mice were more sensitive to Con A-induced hepatitis than wild-type mice (data not shown). For further confirmation, both groups of mice were injected i.v. with titrated doses (2.5–25 mg/kg) of Con A, and serum ALT levels were monitored. As shown in Fig. 1⇓B, although both groups of mice showed dose-dependent elevation of serum ALT levels, WSX-1 knockout mice showed higher serum ALT levels than wild-type mice at all doses of Con A, except 25 mg/kg. In histopathological examinations, massive necrosis of liver parencymal cells was detected in both wild-type and WSX-1−/− mice injected with 25 mg/kg Con A. However, at a dose of 5 mg/kg Con A, although the liver looked normal in wild-type mice, massive necrosis was still observed in WSX-1−/− liver (Fig. 1⇓C). Even at a dose of 2.5 mg/kg Con A, necrosis of parencymal cells was seen in WSX-1 knockout mice (data not shown). These data indicated that WSX-1 deficiency bestowed higher sensitivity to Con A on mice. 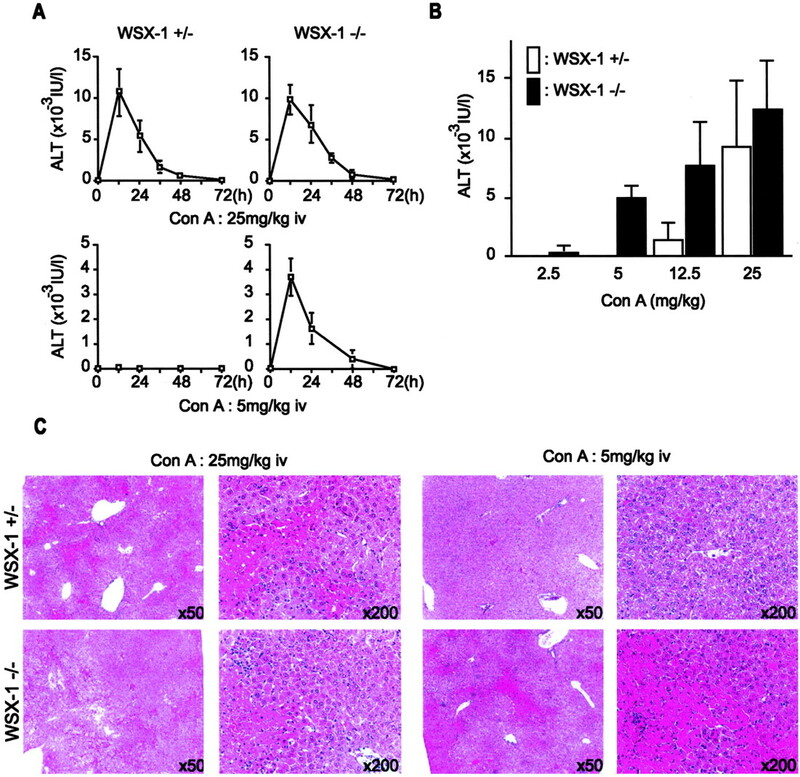 Susceptibility of WSX-1-deficient mice to Con A-induced liver injury. A, WSX-1+/− or WSX-1−/− mice were injected i.v. with 25 or 5 mg/kg body weight of Con A. Serum ALT levels were monitored 12, 24, 36, 48, and 72 h after Con A injection. Data are the mean ± SD (five mice per group) and are representative of three experiments with similar results. Note that ∼80% of WSX-1−/− mice died within 24 h of injection, and the rest survived, whereas all the wild-type mice survived. B, WSX-1+/− (□) or WSX-1−/− (▪) mice were injected with the indicated doses of Con A. Twelve hours after injection, serum ALT levels were measured. Data are the mean ± SD (five mice per group). Experiments were repeated twice with similar results. C, WSX-1+/− or WSX-1−/− mice were injected with 5 or 25 mg/kg Con A. Eighteen hours later, mice were sacrificed, and livers were fixed for microscopic histological examinations (magnifications, ×50 and ×200). Although the precise mechanisms of liver injury have yet to be elucidated, the involvement of cytokines, especially IFN-γ and IL-4, in Con A-induced hepatitis has been reported (9, 11, 29, 30). To address whether both cytokines are also responsible for the Con A-induced hepatitis observed in WSX-1-deficient mice, we treated WSX-1−/− mice with anti-IFN-γ or -IL-4 mAb 2 h before Con A injection. After Con A injection at 5 mg/kg, ALT levels were dramatically reduced to almost the untreated level in mice treated with either anti-IFN-γ mAb or anti-IL-4 mAb (Fig. 2⇓A). In histological examination, as expected, no necroinflammatory lesion was observed in the liver of anti-IFN-γ mAb- or anti-IL-4 mAb-treated WSX-1−/− mice (Fig. 2⇓B). 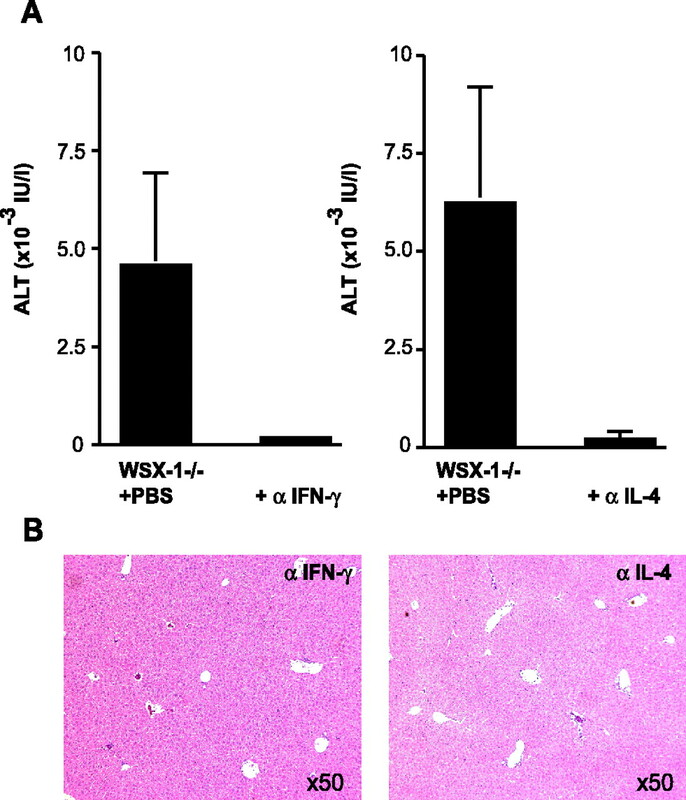 These results demonstrated that both IFN-γ and IL-4 produced in response to Con A stimulation exert an essential effect on sensitivity in the liver injury observed in WSX-1-deficient mice. Essential involvement of IFN-γ and IL-4 in Con A-induced hepatitis. A, WSX-1−/− mice were injected with PBS as a control or with 2 mg each of anti-IFN-γ mAb (left panel) or anti-IL-4 mAb (right panel) 2 h before Con A injection. Twelve hours after Con A injection (5 mg/kg), serum ALT levels were measured. Data are the mean ± SD of five mice per group and are representative of three independent experiments with similar results. B, WSX-1−/− mice treated with anti-IFN-γ mAb (left) or anti-IL-4 mAb (right) were injected with 5 mg/kg Con A. Eighteen hours later, mice were sacrificed, and livers were fixed for microscopic histological examinations (magnification, ×50). Reportedly, NKT cells play critical roles in Con A-induced hepatitis (9, 10, 11). In particular, NKT cells expressing TCR Vα14 are exclusively responsible for liver injury by producing both IL-4 and IFN-γ (11). Nieuwenhuis et al. (31) have recently reported the impaired development of NKT cells in mice deficient for EBI-3, a subunit of the WSX-1 ligand, IL-27. We, therefore, examined whether WSX-1-deficiency affects the development of NKT cells by flow cytometric analysis. 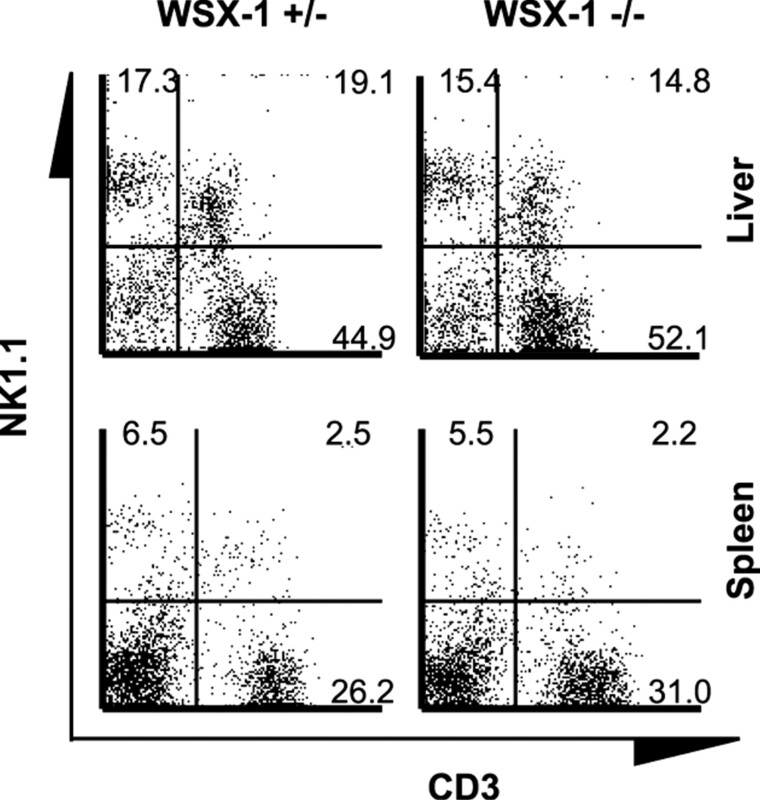 The development of NKT cells in the liver and spleen of WSX-1−/− mice was comparable to that in wild-type mice (Fig. 3⇓). There was no significant difference in the total number of liver and spleen NKT cells from WSX-1−/− and wild-type mice (data not shown). Thus, despite the expression of WSX-1 on NKT cells (our unpublished observation) and the report that EBI-3 deficiency affects NKT cell development, the lack of WSX-1 had no apparent effect on the development of NKT cells. Normal development of NKT cells in WSX-1-deficient mice. Single-cell suspensions of liver MNC (upper panels) or splenocytes from WSX-1+/− or WSX-1−/− mice were stained with FITC-anti-CD3 mAb and PE-anti-NK1.1 mAb. Cells were analyzed for surface expression of each molecule by FACS. The numbers are the percentages of cell populations in each quadrant. Experiments were repeated twice with similar results. We then examined cytokine production in vitro by WSX-1-deficient NKT cells. Liver MNC from either wild-type or WSX-1−/− mice were stimulated in vitro with Con A for 24 h, and the amounts of IFN-γ and IL-4 produced in the culture supernatants were assessed by ELISA. As shown in Fig. 4⇓A, liver MNC from WSX-1−/− mice produced significantly more IFN-γ and IL-4 than MNC from wild-type mice. As MNC isolated from liver contained substantial percentages of T cells (Fig. 3⇑), to further confirm the overproduction of the cytokines by WSX-1-deficient NKT cells, we purified NK1.1+ cells from spleen by MACS and stimulated NK1.1+ cell population devoid of T cells with Con A. The sorted cell populations contained >70% NK1.1+ cells and <8% conventional T cells (Fig. 4⇓B, bottom panels). As NK cells produce neither IFN-γ nor IL-4 in response to Con A (11), NKT cells are the exclusive producer of cytokines in the sorted cell populations. As shown in Fig. 4⇓B, NK1.1+ cells from WSX-1−/− mice produced higher amounts of both IFN-γ and IL-4 than cells from wild-type mice in response to Con A or anti-CD3ε Ab. There was no significant difference in the production of IFN-γ and IL-4 by spleen cells devoid of NK1.1+ cell populations (<2% of NK1.1+ cells; Fig. 4⇓B, bottom panels) from both groups of mice (Fig. 4⇓B, rightmost columns). These results demonstrated that liver MNC and NKT cells from WSX-1−/− mice are more sensitive to Con A stimulation by IFN-γ and IL-4 production than those from wild-type mice. Hyperproduction in vitro of IFN-γ and IL-4 by WSX-1−/− NKT cells. A, Liver MNC were isolated as described in Materials and Methods from naive WSX-1+/− (□) or WSX-1−/− (▪) mice. Cells were stimulated (1 × 105 cells/200 μl) in the presence or the absence of Con A (5 μg/ml) for 24 h. Culture supernatants were collected and analyzed for IFN-γ and IL-4 production by ELISA. B, NK1.1+ cell populations were positively sorted by MACS from spleens of WSX-1+/− or WSX-1−/− mice. Cells were cultured (1 × 105 cells/200 μl) in the presence of irradiated splenocytes (5 × 105 cells/200 μl) as APC and were stimulated for 24 h with Con A (5 μg/ml) or anti-CD3ε Ab (10 μg/ml). Cell populations depleted of NK1.1+ cells (flowthrough populations) were similarly stimulated with 5.0 μg/ml of Con A (rightmost columns). Culture supernatants were examined for IFN-γ and IL-4 production by ELISA. Data are the mean ± SD of triplicate samples. ∗, p < 0.05. Experiments were repeated three times with similar results. Flow cytometric examination of intracellular cytokine production revealed that higher percentages of WSX-1-deficient liver NKT cells produced IFN-γ and IL-4 than wild-type NKT cells (Fig. 5⇓A, left panels). Although more CD4+ T cells from WSX-1−/− mice produced IFN-γ or IL-4 than those from wild-type mice (Fig. 5⇓A, right panels), over production of the cytokines in response to Con A was apparent in NKT populations. Consistent with these observations, in vivo depletion of NK1.1+ cells, including NKT cells, resulted in significant decrease in serum ALT levels (Fig. 5⇓B), whereas depletion of NK cells with anti-asialo-GM1 Ab had no effect on liver damage after Con A injection (not shown). 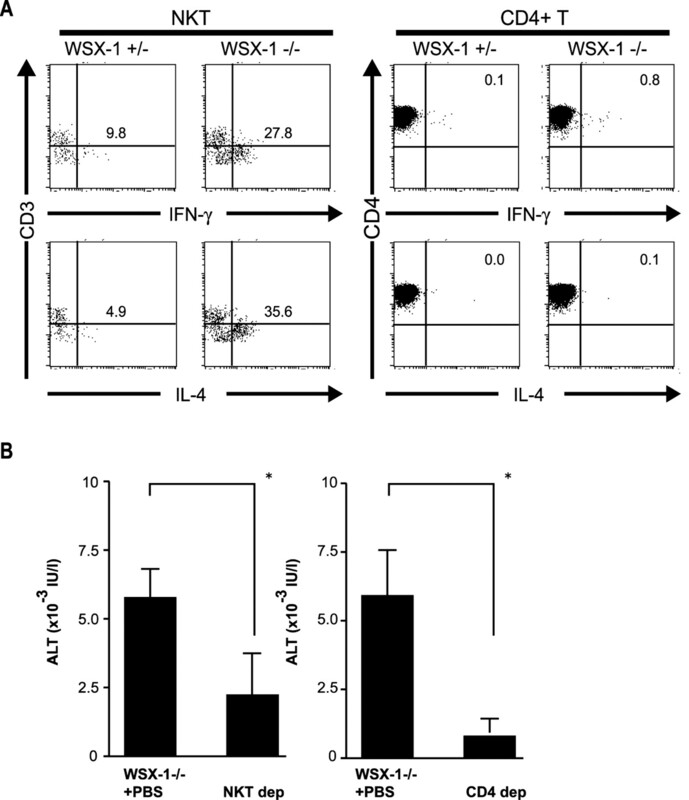 Although production of IFN-γ and IL-4 by CD4+ T cells was not as evident as that by NKT cells (Fig. 5⇓A), depletion of CD4+ T cells also reduced serum ALT levels, indicating that CD4+ T cells make a significant contribution to the Con A-induced liver pathology. Hyperproduction in vivo of IFN-γ and IL-4 by WSX-1−/− NKT cells. A, WSX+/− or WSX-1−/− mice were injected with 5 mg/kg Con A. Two hours after injection, liver MNC were prepared and examined for intracellular cytokine production as described in Materials and Methods. Numbers are the percentages of IFN-γ- or IL-4-positive cells within NK1.1+CD3+ (NKT, left panels) or NK1.1−CD4+ (CD4, right panels) cell populations. Experiments (three or four mice per group) were repeated three times with similar results. B, WSX-1−/− mice were injected with PBS or depleted of NK1.1+ cells (NKT dep) or CD4+ T cells (CD4 dep) as described in Materials and Methods. Twelve hours after Con A injection (5 mg/kg), serum ALT levels were measured. Experiments were repeated three times with similar results. ∗, p < 0.05. Next we examined cytokine expression by liver MNC after Con A injection by RT-PCR analyses and found that in addition to IFN-γ and IL-4 described above, the expression of IL-5 and TNF-α, cytokines reportedly involved in Con A hepatitis (17, 19), was unexpectedly higher in the knockout than in wild-type mice (data not shown). For further confirmation, we examined the production of cytokines in sera after Con A injection (Fig. 6⇓). With low dose of Con A injection (5 mg/kg), there was little, if any, increase in IFN-γ and IL-4 in wild-type mice. However, with the same dose of Con A, significantly more IFN-γ and IL-4 were produced in the sera of WSX-1 knockout mice at 2 h after injection. In addition, several proinflammatory cytokines, including TNF-α, IL-6, IL-1β, and IL-12, were more highly produced in the knockout than in the wild-type mice. These results suggested that WSX-1 knockout mice were more susceptible to Con A-induced hepatitis than WSX-1 wild-type mice by overproduction of IFN-γ and IL-4 as well as various proinflammatory cytokines that collectively lead to liver injury. Hyperproduction of proinflammatory cytokines in WSX-1-deficient mice after Con A treatment. WSX+/− (○) or WSX-1−/− (▪) mice (three to five mice per group) were injected with 5 mg/kg Con A. Serum specimens were collected at 0, 2, and 6 h after Con A injection. Sera were examined for cytokine production in triplicate as described in Materials and Methods. The ordinate indicates serum cytokine concentration in picograms per milliliter. Experiments were repeated three times with similar results. ∗, p < 0.05. In the current study we showed that WSX-1 knockout mice are more susceptible to Con A-induced hepatitis than wild-type mice. Although the development of WSX-1-deficient NKT cells appeared normal, these NKT cells produced more IFN-γ and IL-4 in response to in vitro Con A stimulation than wild-type cells. In addition, various proinflammatory cytokines were overproduced in Con A-treated WSX-1 knockout mice. These data demonstrated a novel role for WSX-1 as an inhibitory regulator of proinflammatory cytokine production. Con A-induced hepatitis is an experimental model of human autoimmune hepatitis. Administration of Con A immediately activates several immunocytes and induces production of various cytokines (32). Especially IFN-γ and IL-4 play a key role in the liver injury. Mice lacking IFN-γ or IL-4 are resistant to Con A-induced hepatitis (9, 16). In our experimental system with WSX-1-deficient mice, both IFN-γ and IL-4 were also essential for liver injury, as the administration of anti-IFN-γ or anti-IL-4 mAbs significantly reduced serum ALT levels and hepatocyte necrosis (Fig. 2⇑). Thus, overproduction of IFN-γ and IL-4 in WSX-1 knockout mice (Figs. 4–6⇑⇑⇑) seems to be the primary cause of the susceptibility to Con A-induced liver injury. NKT cells have an ability to promptly produce both IFN-γ and IL-4 in response to Con A or anti-CD3 stimulation (12, 13), and as such, NKT cells are assumed to act as a trigger of Con A hepatitis. Actually, Con A-induced hepatitis was not induced in mice lacking TCR Vα14-positive NKT cells (11). In our current study also, NKT cells were largely responsible for the hyperproduction of IFN-γ and IL-4, because not only liver MNC containing substantial percentages of NKT cells, but also purified spleen NKT cells from WSX-1 knockout mice produced significantly higher amounts of both cytokines (Fig. 4⇑). In addition, it was demonstrated that WSX-1-deficient NKT cells produced more IFN-γ and IL-4 than wild-type NKT cells by cytokine FACS analysis (Fig. 5⇑). CD4+ T cells, however, are also responsible in part for Con A-induced hepatitis, because depletion of CD4+ T cells also resulted in reduced serum ALT levels (Fig. 5⇑B). The reduction was more evident in CD4+ T cell-depleted mice than in NKT cell-depleted mice, whereas cytokine production was more evident by in NKT cells than in CD4+ T cells (Fig. 5⇑A). This discrepancy may be attributable to the fact that CD4+ T cells exceed NKT cells in total number and, subsequently, in the amounts of cytokines produced. Currently, it is not clear whether CD4+ T cells are activated primarily by Con A or secondarily to overproduced cytokines. Overproduction of IFN-γ by WSX-1-deficient NKT cells was initially unexpected. In our previous report, IFN-γ production by differentiating WSX-1-deficient CD4+ T cells was impaired, demonstrating the essential role of WSX-1 in Th1 differentiation (22). In support of this, we also reported that Il-12Rβ2 expression was impaired in WSX-1-deficient CD4+ T cells (23). Moreover, Pflanz et al. (24) reported that IL-27, a candidate ligand for WSX-1, was an inducing factor of IFN-γ by naive CD4+ T cells. However, contrary to our presupposition that WSX-1 knockout mice may be resistant to Con A hepatitis by reduced IFN-γ production, the knockout mice were more sensitive to Con A stimulation by overproduction of various cytokines, including IFN-γ. The apparent discrepancy may be explained by swapping of receptor and/or ligand subunits. In an analogy to IL-12R (and other cytokine receptors), WSX-1 is assumed to bind to a countersubunit that has yet to be identified to conform to a functional receptor complex. As observed in IL-12R (IL-12Rβ1 plus -β2 on Th1 effecter cells) vs IL-23R (IL-12Rβ1 plus unique IL-23R on Th1 memory cells) (33), it is very likely that distinct subunits are used in distinct cell populations, i.e., CD4+ cells and NKT cells, to exert different functions. Similarly, it is also possible that distinct ligands, such as IL-27 (p28 plus EBI-3) vs EBI-3 plus p35 of IL-12 (24, 34), bind to the WSX-1 receptor complex in various settings (see Ref. 35 for review). From these points, it is intriguing that mice lacking EBI-3 (a subunit of IL-27) showed defects in NKT cell development (31). As our mice lacking WSX-1 (a subunit of the putative IL-27R) showed apparently normal development of NKT cells in both liver and spleen (Fig. 3⇑) with more activated phenotype in terms of cytokine production (Fig. 4⇑ and 5⇑), results obtained by WSX-1 knockout mice and EBI-3 knockout mice are seemingly contradictory. It is therefore assumed that EBI-3 may bind to a receptor distinct from WSX-1 for NKT cell development. It is strongly suggested that the interrelation among IL-12 family members (both receptors and ligands) is polygamous, but not one-on-one, to exert various effects on various types of cells. In support of this idea, addition of rIL-27 to the culture of NKT cells for in vitro Con A stimulation (Fig. 4⇑) did not restore the overproduction of cytokines (data not shown), indicating that IL-27 may not be the ligand for WSX-1 on NKT cells. However, it is also possible that WSX-1-deficient NKT cells are differently educated in vivo in the absence of IL-27/WSX-1 signaling (see below). The cellular source of the ligand for WSX-1 on NKT cells is currently unknown. Purified WSX-1-deficient NKT cells produced more IFN-γ and IL-4 when stimulated in vitro without the addition of APC (data not shown). It is thus possible that NKT cells may produce the ligand themselves in an autocrinal fashion. However, as IL-12 and related cytokines are mainly produced by cells of the macrophage/monocyte lineage, a small percentage of macrophages contaminating the culture may be responsible for the ligand production. Of interest, overproduction of proinflammatory cytokines by WSX-1-deficient mice was detected as early as 2 h after Con A injection (Fig. 6⇑). NKT cells are equipped for the production of IFN-γ and IL-4 upon stimulation (12, 13). Developing and/or mature NKT cells may be continuously exposed to the WSX-1 ligand in vivo, and WSX-1-deficient NKT cells may be educated in a different way so as to produce more cytokines upon stimulation. It is thus possible that intracellular conditions, such as the expression of transcription factors and/or chromatin remodeling for IFN-γ and IL-4, are different in the absence of WSX-1 signaling. In addition to IFN-γ and IL-4, various proinflammatory cytokines were overproduced in WSX-1-deficient mice after Con A treatment (Fig. 6⇑), which collectively contributed to the devastating liver injury observed in the knockout mice (Fig. 1⇑). Although NKT cells are the primary source of IFN-γ and IL-4, and presumably IL-5 (19), cytokines such as TNF-α, IL-1, and IL-6 are probably produced by Kupffer cells in the liver (8) in response to IFN-γ and IL-4 produced by NKT cells. As macrophages are positive for the expression of WSX-1 by RT-PCR (22), it is possible that WSX-1-deficient macrophages (Kupffer cells) are also more sensitive to stimulation and are prone to overproduction of inflammatory cytokines. Interestingly, overproduction of proinflammatory cytokines is not exclusive to Con A-induced hepatitis mediated by NKT cells. In an experimental T. cruzi infection in WSX-1-deficient mice, overproduction of proinflammatory cytokines in addition to IFN-γ and IL-4 was observed (26). In addition, Villarino et al. (25) reported hyperactivation of WSX-1-deficient CD4+ T cells during T. gondii infection. Although the precise molecular mechanisms for the overproduction of cytokines and cellular activation are under investigation, the involvement of IL-10, an anti-inflammatory cytokine (18), is unlikely, because the production of IL-10 was not reduced in WSX-1-deficient mice compared with that in wild-type mice after Con A treatment (data not shown). Recent advances have revealed that the development of naive CD4+ cells into fully differentiated Th1 cells was more finely regulated than initially envisioned. For the initial commitment of naive CD4+ T cells into Th1, IL-27/WSX-1 is critical for T-bet-mediated IL-12Rβ2 expression. In committed Th1 cells, IL-12/IL-12R plays a central role for IFN-γ production by STAT4 activation. Memory CD4+ T cells resort to IL-23/IL-23R for their proliferation and augmentation of IFN-γ production (for review, see Refs. 35, 36, 37). However, the roles played by members of the expanding IL-12 family are not limited to Th1 differentiation and IFN-γ production. For instance, Wiekowski et al. (38) reported that mice with transgenic expression of p19 of IL-23 showed systemic inflammation and increased serum levels of TNF-α and IL-1. Lack of IL-12Rβ1 (also a subunit for the IL-23R complex) resulted in reduced IL-1 production and inflammation in coxsackie virus B3-induced myocarditis in mice (39). Our findings of overproduction of proinflammatory cytokines by NKT cells in Con A-treated WSX-1-deficient mice confirm the recently proposed novel role for WSX-1 as an inhibitory regulator of inflammation and cytokine production (25, 26). With further identifications of new relatives of IL-12 and/or IL-12R, the precise scheme for ligand and receptor combination will be complete, which will raise opportunities for therapeutic intervention against autoimmune diseases and some infections. We thank Dr. Y. Fukui and T. Sanui for technical advice, S. Muroi for animal husbandry, and members of Project W for helpful discussion. ↵1 This work was supported in part by grants from the Ministry of Education, Science, Technology, Sports, and Culture of Japan (to H.Y. and A.Y.) and a grant-in-aid from the Tokyo Biochemical Research Foundation (to S.H.). ↵3 Abbreviations used in this paper: ALT, alanine aminotransferase; MNC, mononuclear cell. Koziel, M. J.. 1999. Cytokines in viral hepatitis. Semin. Liver Dis. 19:157. McFarlane, I. G.. 1999. Pathogenesis of autoimmune hepatitis. Biomed. Pharmacother. 53:255. Tiegs, G., J. Barsig, B. Matiba, S. Uhlig, A. Wendel. 1994. Potentiation by granulocyte macrophage colony-stimulating factor of lipopolysaccharide toxicity in mice. J. Clin. Invest. 93:2616. Lohr, H. F., J. F. Schlaak, G. Gerken, B. Fleischer, H. P. Dienes, K. H. Meyer zum Buschenfelde. 1994. Phenotypical analysis and cytokine release of liver-infiltrating and peripheral blood T lymphocytes from patients with chronic hepatitis of different etiology. Liver 14:161. Barnaba, V., A. Franco, M. Paroli, R. Benvenuto, G. De Petrillo, V. L. Burgio, I. Santilio, C. Balsano, M. S. Bonavita, G. Cappelli, et al 1994. Selective expansion of cytotoxic T lymphocytes with a CD4+CD56+ surface phenotype and a T helper type 1 profile of cytokine secretion in the liver of patients chronically infected with hepatitis B virus. J. Immunol. 152:3074. Tiegs, G.. 1997. Experimental hepatitis and role of cytokines. Acta Gastroenterol. Belg. 60:176. Schumann, J., D. Wolf, A. Pahl, K. Brune, T. Papadopoulos, N. van Rooijen, G. Tiegs. 2000. Importance of Kupffer cells for T-cell-dependent liver injury in mice. Am. J. Pathol. 157:1671. Toyabe, S., S. Seki, T. Iiai, K. Takeda, K. Shirai, H. Watanabe, H. Hiraide, M. Uchiyama, T. Abo. 1997. Requirement of IL-4 and liver NK1+ T cells for concanavalin A-induced hepatic injury in mice. J. Immunol. 159:1537. Takeda, K., Y. Hayakawa, L. Van Kaer, H. Matsuda, H. Yagita, K. Okumura. 2000. Critical contribution of liver natural killer T cells to a murine model of hepatitis. Proc. Natl. Acad. Sci. USA 97:5498. Kaneko, Y., M. Harada, T. Kawano, M. Yamashita, Y. Shibata, F. Gejyo, T. Nakayama, M. Taniguchi. 2000. Augmentation of Vα14 NKT cell-mediated cytotoxicity by interleukin 4 in an autocrine mechanism resulting in the development of concanavalin A-induced hepatitis. J. Exp. Med. 191:105. Chen, H., W. E. Paul. 1997. Cultured NK1.1+ CD4+ T cells produce large amounts of IL-4 and IFN-γ upon activation by anti-CD3 or CD1. J. Immunol. 159:2240. Burdin, N., L. Brossay, Y. Koezuka, S. T. Smiley, M. J. Grusby, M. Gui, M. Taniguchi, K. Hayakawa, M. Kronenberg. 1998. Selective ability of mouse CD1 to present glycolipids: α-galactosylceramide specifically stimulates Vα14+ NK T lymphocytes. J. Immunol. 161:3271. Cao, Q., R. Batey, G. Pang, A. Russell, R. Clancy. 1998. IL-6, IFN-γ and TNF-α production by liver-associated T cells and acute liver injury in rats administered concanavalin A. Immunol Cell Biol. 76:542. Kim, K. M., Y. M. Kim, M. Park, K. Park, H. K. Chang, T. K. Park, H. H. Chung, C. Y. Kang. 2000. A broad-spectrum caspase inhibitor blocks concanavalin A-induced hepatitis in mice. Clin. Immunol. 97:221. Tagawa, Y., P. Matthys, H. Heremans, C. Dillen, Z. Zaman, Y. Iwakura, A. Billiau. 2000. Bimodal role of endogenous interleukin-6 in concanavalin A-induced hepatitis in mice. J. Leukocyte Biol. 67:90. Kato, M., N. Ikeda, E. Matsushita, S. Kaneko, K. Kobayashi. 2001. Involvement of IL-10, an anti-inflammatory cytokine in murine liver injury induced by concanavalin A. Hepatol. Res. 20:232. Louis, H., A. Le Moine, V. Flamand, N. Nagy, E. Quertinmont, F. Paulart, D. Abramowicz, O. Le Moine, M. Goldman, J. Deviere. 2002. Critical role of interleukin 5 and eosinophils in concanavalin A-induced hepatitis in mice. Gastroenterology 122:2001. Takeda, A., S. Hamano, A. Yamanaka, T. Hanada, T. Ishibashi, T. W. Mak, A. Yoshimura, H. Yoshida. 2003. Role of IL-27/WSX-1 signaling for induction of T-Bet through activation of STAT1 during initial Th1 commitment. J. Immunol. 170:4886. Hamano, S., K. Himeno, Y. Miyazaki, K. Ishii, A. Yamanaka, A. Takeda, M. Zhang, H. Hisaeda, T. W. Mak, A. Yoshimura, et al 2003. WSX-1 is required for resistance to Trypanosoma cruzi infection by regulation of proinflammatory cytokine production. Immunity 19:657. Sonoda, K. H., M. Exley, S. Snapper, S. P. Balk, J. Stein-Streilein. 1999. CD1-reactive natural killer T cells are required for development of systemic tolerance through an immune-privileged site. J. Exp. Med. 190:1215. Kusters, S., F. Gantner, G. Kunstle, G. Tiegs. 1996. Interferon γ plays a critical role in T cell-dependent liver injury in mice initiated by concanavalin A. Gastroenterology 111:462. Mizuhara, H., M. Uno, N. Seki, M. Yamashita, M. Yamaoka, T. Ogawa, K. Kaneda, T. Fujii, H. Senoh, H. Fujiwara. 1996. Critical involvement of interferon γ in the pathogenesis of T-cell activation-associated hepatitis and regulatory mechanisms of interleukin-6 for the manifestations of hepatitis. Hepatology 23:1608. Nieuwenhuis, E. E., M. F. Neurath, N. Corazza, H. Iijima, J. Trgovcich, S. Wirtz, J. Glickman, D. Bailey, M. Yoshida, P. R. Galle, et al 2002. Disruption of T helper 2-immune responses in Epstein-Barr virus-induced gene 3-deficient mice. Proc. Natl. Acad. Sci. USA 99:16951. Sass, G., S. Heinlein, A. Agli, R. Bang, J. Schumann, G. Tiegs. 2002. Cytokine expression in three mouse models of experimental hepatitis. Cytokine 19:115. Brombacher, F., R. A. Kastelein, G. Alber. 2003. Novel IL-12 family members shed light on the orchestration of Th1 responses. Trends Immunol. 24:207. Robinson, D. S., A. O’Garra. 2002. Further checkpoints in Th1 development. Immunity 16:755. Wiekowski, M. T., M. W. Leach, E. W. Evans, L. Sullivan, S. C. Chen, G. Vassileva, J. F. Bazan, D. M. Gorman, R. A. Kastelein, S. Narula, et al 2001. Ubiquitous transgenic expression of the IL-23 subunit p19 induces multiorgan inflammation, runting, infertility, and premature death. J. Immunol. 166:7563.